Listen as California Personal Injury Attorney Frank Nunes explains who will pay the attorney in your car accident case. Under a concept known as the American Rule, each party typically pays its own attorney’s fees in personal injury cases. 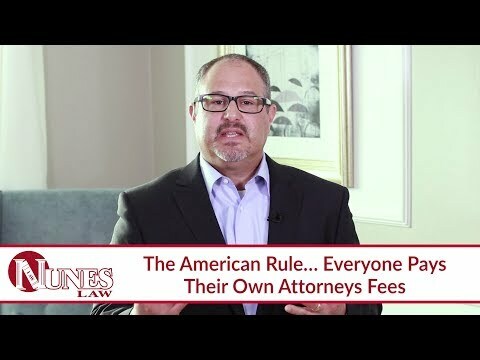 Sometimes there are exceptions in other areas of law when there is a particular statute that applies, or when there is an agreement for the losing side to pay the winner’s attorney’s fees. Also important regarding your payment to your attorney is the contingency fee system. In this arrangement, an attorney is paid a percentage of the recovery, as negotiated between you and the attorney. This allows an individual person to be able to afford to take on a large corporation, and it also gives incentive for the attorney to recover a maximum amount for the client. In summary, you will typically pay your own attorney’s fees, and this amount is dependent upon your negotiated agreement with your attorney. Under a contingency fee system, if you do not win your case, you may owe nothing to your attorney. Watch the video to learn more. If you have questions about a lawsuit or would like to discuss another legal matter, I want you to call me at 559-436-0850. I welcome your call. Or, visit our website at http://www.NunesLaw.com to reference our educational library.